Inbound marketing is a vital part of any business strategy. Being able to both communicate your message and bring in leads to your company, is a sure fire way of growing your audience and converting them to the buying stage. Over the years we have looked at the buyer’s journey and acted as an inbound marketing agency to many clients in a variety of markets. 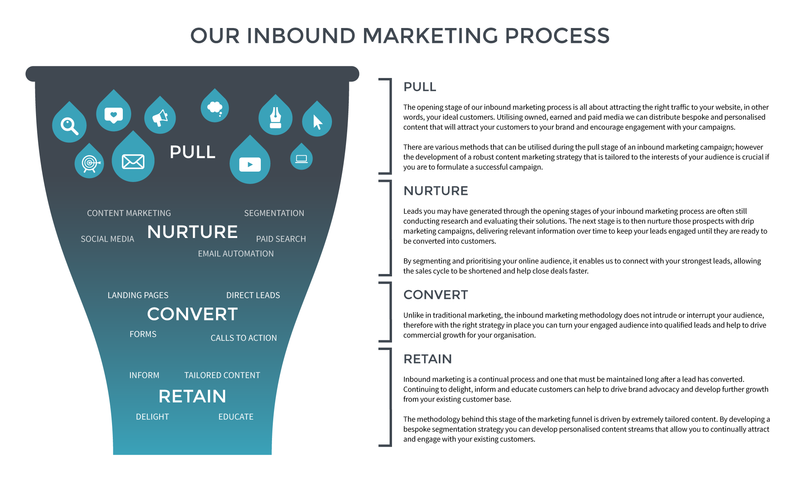 Inbound marketing is the process of helping potential customers find a company by utilising various forms of pull marketing, such as blogs, whitepapers, eBooks, podcasts, webinars, video, SEO and social media. Inbound marketing involves creating relevant, valuable and original content, optimising it and distributing it across a variety of online media channels. The aim of this process is to attract audiences, increase brand awareness, convert leads and increase ROI. The experience that we have gained means that we are able to create a buzz around your brand and drive quality leads to your business with a robust inbound marketing strategy. This inbound marketing methodology involves magnetising your brand to encourage prospects and customers to approach and engage with you. Traditional marketing methods are no longer enough to captivate and retain customer interest. Audiences are becoming increasingly wise to conventional marketing tactics and are more likely to ‘switch off’ when they know they are being sold to. Savvy marketers understand that they must adapt their strategies to create lasting connections using genuinely informative and personalised material. Through our inbound marketing service, we aim to boost awareness of your brand and drive quality leads to your site, through the creation and targeted distribution of engaging, informative content. Using leading marketing automation platform, Act-On, we can implement effective nurturing campaigns to attract, convert and retain your prospects and repeat customers. Act-On is a marketing automation platform that streamlines, automates and measures inbound marketing campaigns. The platform is designed to cultivate and engage with your consumers at each stage of the buyer’s journey. Through Act-On we can implement campaigns to attract, nurture and convert your current prospects, while continuing to educate and delight converted consumers. The system allows us to identify, prioritise and connect with your strongest prospects, shortening the path to purchase. The insight provided by the platform allows our team of experts to create highly targeted and data-driven inbound campaigns, delivering the results that matter to your brand’s sales and marketing and objectives. Understanding the needs and requirements of your consumers is fundamental when developing a successful inbound marketing strategy. Our strategic approach delivers a consistent brand message that resonates with your target audience, allowing your campaigns to be seen and heard by the right people, at the right time. From the outset of your inbound campaign, we will implement visitor tracking to your website that will enable our team to begin monitoring and recording your audience’s online activity, including engagement, interaction, interests and behaviour. From this point onwards, each known prospect within your audience database will tracked and a unique activity log will be created and maintained for each user. Act-On’s lead scoring uses a points based system that allows you generate a funnel that is tailored to your brand’s overall sales and marketing objectives. At the opening of your inbound marketing campaign, our team will work closely with you to establish a range of values that will be assigned to each element of your campaign. Areas such as website visits, email click through and content assets will each be assigned a unique value, which will help to paint an overall picture of how your audience interacts with your brand, enabling leads to be managed more effectively. Utilising Act-On’s unique prospect segmentation tool, our expert team will help you to identify, prioritise and connect with your audience. By formulating extremely targeted segments, campaigns can be built which are tailored to each stage of the consumer buying cycle, creating a personalised strategy to help generate engagement and boost conversions. Leads you may have generated through the ‘attract’ and ‘engage’ stages of your inbound marketing process are often still conducting research and evaluating their solutions. The next stage is to then nurture those prospects with drip marketing campaigns, delivering relevant information over time to keep your leads engaged until they are ready to be converted into customers. As part of your inbound marketing strategy we can plan, execute and deliver structured nurturing campaigns and analyse their success on each occasion, and all findings are used to help develop future campaigns. By segmenting and prioritising your online audience, it enables us to connect with your strongest leads, allowing the sales cycle to be shortened and help close deals faster. User behaviour, interest and engagement – Utilising Act-On’s behavioural insight reports, we can generate audience segments based around real-time online behaviour and engagement. When segmenting your audience based upon prior engagement, our team are then able to create extremely personalised campaigns, allowing for more relevant content to be produced for each stage of the buying cycle. Cascade – We can create a multi-stage campaign based upon audience engagement. Each stage of the campaign will be focused around moving users through your marketing funnel, taking into consideration user engagement and actions at each stage of the campaign. User profile – Our team of experts can work with you to create unique segments based upon user profiling. In the case of B2C’s you may wish to target a particular age range, on the B2B side you may have a particular industry sector that you would like to target, whatever your requirements we can generate bespoke campaigns that are tailored to your unique audience profiles. High quality content lies at the heart of any fruitful inbound marketing strategy and as such, it lies at the heart of our inbound marketing service, too. As part of your strategy, our team of talented content writers can plan and devise content for your brand, which will then be distributed to your audience throughout your nurturing campaigns. From whitepapers to infographics, our copywriters are adept at crafting content in a diverse range of styles and on a plethora of topics. Alternatively, if you have your own content that you would like to use within your nurturing campaigns, we can work with that too. 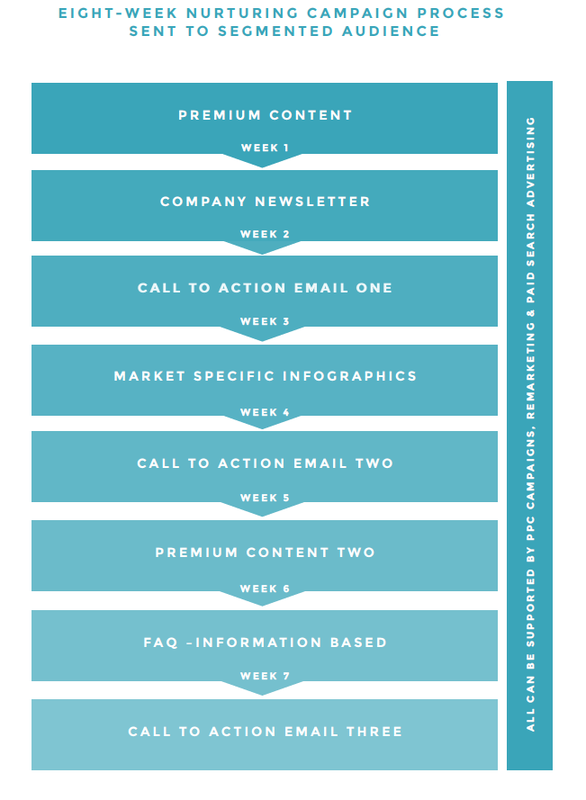 Mapping out the process of your inbound strategy is key if you are to achieve your overall campaign goals. After establishing the key objectives, we can deliver a bespoke process map for your inbound campaign, detailing all elements we intend to use, the length of the campaign and the intended segmentation strategy. We provide bespoke monthly reports for each inbound marketing campaign we conduct. Our team actively monitor the performance of each element of your campaign through Act-On’s bespoke reporting suite and measure the impact using industry leading analytical tools. Our detailed reports contain statistics surrounding your campaign performance, however if you have any particular areas you would like your report to focus on, we can tailor your report to highlight areas that you would like to review.